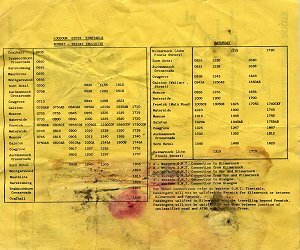 Does any one remember the bus services in Sorn. The roadwork's at Mauchline in the summer of 2010 brought with it more buses, than the village has ever seen. The Ayr, Kilmarnock, and Glasgow buses all went through Sorn, right up until the last bus at night. I guess Sorn has always been isolated. In my own memory, I recall the Killie buses that ran on a Friday and Saturday I think it was, via Galston. As a youngster, it was always fun to hear the double deckers crashing against the low tree branches on the way to the "toon" with mother. I also remember Tom Lorimer's Land Rover's and Mini Buses / taxi's. 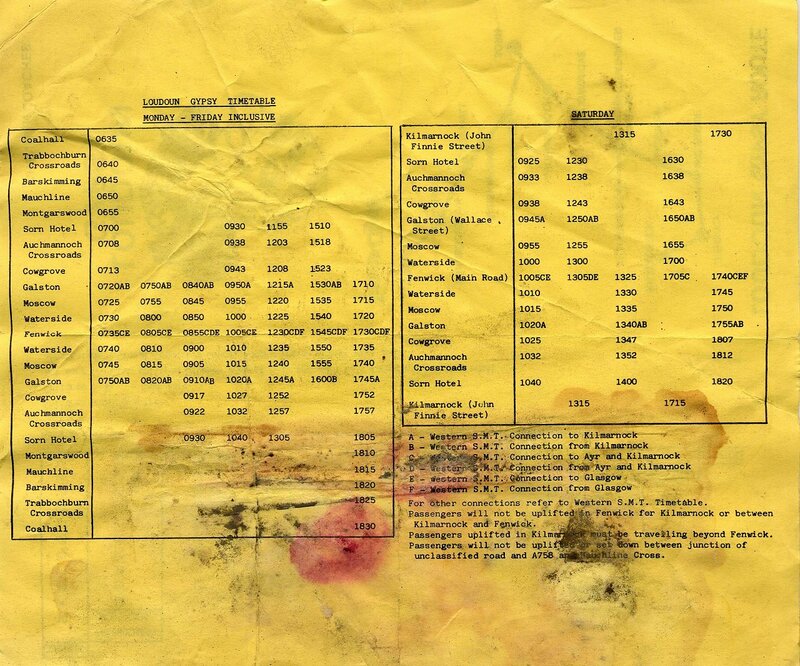 But another forgotten bus service timetable was discovered in a pile of old junk. The Loudoun Gypsy. This service left from the village hall car park, and went via Galston to Fenwick, where you either met up with a Glasgow bus or a Killie bus. I suspect this would have run about 1980.